That’s it. Those are the only numbers you get. Now, using only those stats, compare Lorenzo Cain to David Ortiz. You’ll probably want to cheat and use some kind of subjective, non-numerical adjustments. Ortiz plays in a better hitter’s park. Cain is a good defensive center fielder and a good baserunner, while Ortiz is a lumbering mass of home runs and RBI and OBP sitting around in the dugout for half the game so that his pitchers don’t implode in a torrent of expletives every time a ground ball is hit to the right side, et cetera. And rightly so. Those things matter. You can’t do that, though. Those numbers above are all you get. This is, of course, a nearly impossible task. Or rather, it might not be particularly hard to do, but the results won’t be very good. And yet, for decades, that is exactly what went into MLB’s official player ranking system (generally called the Elias ratings, after the Elias Sports Bureau which developed and calculated them). The algorithm was never officially published, but Eddie Bajek from the blog Tigers Thoughts managed to reverse engineer the process. Outfielders, first basemen and DHs were rated based purely on the above stats. For infielders other than first basemen, a nominal stab at defensive value (fielding percentage and total defensive chances, or fielding percentage and assists for catchers) was included. Pitchers had their own set of baseball-card stats to feed into the formula. The results were, unsurprisingly, underwhelming. These underwhelming results were then used to determine which free agents were classified as “Type A” and “Type B” for the purposes of draft pick compensation, with Type A free agents costing their signing team its first round draft pick. As teams grew more sophisticated at evaluating players, the outdated Elias ratings started making less and less sense. Free agents who were not highly coveted but were nonetheless flagged as Type A by the formula were hit with an unfairly heavy burden, with the draft penalty in some cases eating up most of their market value. 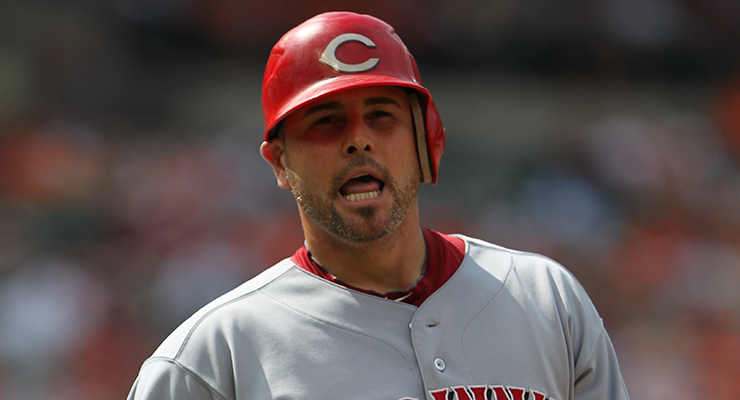 In 2010, for example, Ramon Hernandez was classified as a type A free agent and re-signed with Cincinnati for one year and $3 million. Fellow catcher John Buck, who rated below Hernandez in the Elias rankings and didn’t come with any draft penalty, signed with the Marlins that same offseason for three years and $18 million. In 2009, Juan Cruz struggled to find a team at all after being saddled with Type A status, as teams were reluctant to give up their first round pick for a middle reliever. He finally signed with Kansas City on the eve of spring training for significantly less than similar non-Type-A relievers who had signed earlier in the offseason. The system was clearly broken. After the 2011 offseason, MLB finally did away with the Elias rankings in favor of the current qualifying offer system, which does a much better job at identifying the most valuable free agents. It may be time to do something similar to the salary arbitration process. The idea behind salary arbitration is important: How do you make sure players are fairly compensated for their performance without exposing them to the open market? Because players are generally not eligible for free agency until they’ve accrued six full years of major league service, it is important to have an intermediate step between being assigned a salary near the league minimum and being able to negotiate with other teams as a free agent. Currently, that step is the arbitration process. Unlike the Elias rankings, which rigidly conformed to a narrow set of guidelines, arbitration panels are given only vague instructions and have quite a bit of freedom to interpret player statistics and intangibles. If we go back to the above Cain/Ortiz example, that means they could make all those subjective adjustments to the basic stats, or they could use better stats to begin with, such as those from The Bill James Handbook, which is frequently cited in arbitration hearings. They could very well come to the conclusion that Cain is more valuable than Ortiz right now. In other words, the arbitration process is going to have similar trouble valuing someone like Cain compared to someone like Ortiz. And okay, Cain probably isn’t the best example of someone undervalued by the arbitration process. He gets a lot of his value from batting average, even hitting the subjectively eye-catching .300 mark each of the past two seasons. His power numbers took a decent jump in 2015, which, along with settling into the number-three spot in a much-improved Royals offense, helped push his RBI totals to new heights as well. He made the All-Star team and finished third in the MVP voting last year, and was generally perceived as the top player on a team that both won the World Series and set a franchise attendance record (team performance and attendance figures are explicitly permitted as evidence in arbitration hearings). Still, power hitters who provide less overall value than Cain can end up getting paid just as much in arbitration. Last year, for example, Brandon Moss agreed to a $6.5 million contract with Cleveland. Mark Trumbo won his arbitration hearing for $6.9 million. Cain, who is now in the same service class (four-plus years) as both were, just signed an extension that pays him $6.5 million in 2016. This was even more true last year, when Cain was still bouncing around the bottom of the order but was already pretty valuable due to his elite defense and good contact hitting. His $2.725 million salary in 2015 was at roughly the same level as fellow service-class members Domonic Brown, Tyler Flowers and Wilin Rosario, none of whom projected to be nearly as valuable as Cain even before Cain had his breakout year. In an open market system, we would expect the points in the above graph to bunch much more closely around a straight line (and, if we graph free agent signings in the same way, we do in fact see this—see below). Instead, we have a number of outliers even beyond Cain who made significantly more or less than we’d expect from their projected value. I’ve labeled a few of these, but I’d like to particularly note two of them: Addison Reed and Steve Cishek. Reed and Cishek highlight a major flaw that arbitration values share with the old Elias rankings: Relievers are severely overvalued relative to other players. Despite being projected at less than one WAR each, both were among the highest paid players in the service class. (In fact, if Lance Lynn’s three-year/$22 million extension had followed a more typical payment structure with annual raises covering his arbitration years rather than a flat ~$7 million throughout, Cishek would have been the top paid player in the class, at least in terms of 2015 salary). *multi-year free agent contracts were adjusted using TangoTiger’s shortcut method for comparing contracts of varying lengths: Annual Average Salary + Years Signed – 1, which is not the most precise method and probably needs to be updated for the game’s current financial climate, but should be good enough for non-analytic graphing purposes. **Harper’s situation was complicated — he likely accepted an offer below his actual arbitration value because he was not guaranteed to get an arbitration hearing if he declined. There are some interesting non-pitcher outliers—for example, Chris Carter, helped by his 37 home runs in 2014, earned almost as much as Josh Donaldson—but again we see relievers consistently standing out. Zach Britton, who moved to the bullpen in 2014 after failing to make the Orioles’ starting rotation and being out of options, turned a successful season as Baltimore’s closer into a $3.2 million salary, which matched Garrett Richards for the highest of any pitcher in his service class. This is most apparent in the four-plus year service class, where relievers Greg Holland and Aroldis Chapman topped all arbitration salaries and Kenley Jansen tied Stephen Strasburg for the third-highest pitcher salary in the service class. Including Drew Storen, four of the top five paid pitchers in the service class worked from the bullpen. You virtually never see relievers get anything close to the top contracts on the free agent market. And yet, relievers were either the top or very close to the top paid pitchers in three of the four arbitration service classes last year, a major sign that arbitration values don’t accurately reflect market value. So how do we get arbitration salaries back in line with market valuations? One option would be to simply update the stats used by arbitration panels. If front offices have mostly moved on from their heavy reliance on batting average and RBIs to evaluate players, it would make sense for arbitration panels, which ostensibly aim to mimic the market value of each player, to likewise move on. This approach has its shortcomings, however. For one, arbitration panels are not made up of the type of analytics and scouting experts that front offices rely on to evaluate players, but rather of legal and labor experts who have other duties besides ruling on baseball salaries. They can’t really be expected to keep up with advances in player evaluation with nearly the efficiency that front offices have to. Just as importantly, the process itself is resistant to change because of how heavily it relies on precedents and comparables. The current process works the way it does not because MLB specifically outlined this set of statistics in its criteria, as was the case with the Elias rankings, but because of the gradual build-up of precedents over several decades. In fact, MLB’s official criteria for arbitration hearings is surprisingly sparse, allowing for almost any evidence either side feels is relevant to be presented. As a result, the stats that hold the most weight in arbitration hearings are those that have been swaying cases since the 1970s. Modernizing the process would require not only providing new guidelines to arbitrators regarding what statistics should be given the most weight, but also that they figure out how to compare new cases to past cases that were decided using different criteria. That’s not to say that pushing for more modern criteria in hearings wouldn’t help: It would certainly be at least a step in the right direction. I’m not convinced it will solve the problem, though, especially because the problems with the current system run deeper than outdated stats. Teams and players both view the hearings as something of a necessary evil, something that serves an important function but that no one actually wants to go through. If MLB could replace the process with something that accomplishes the same goals without the hearings, it would benefit both sides. Another problem is that arbitration values are not keeping up with free agent values. The arbitration process relies heavily on comparing a player’s performance to similar players from previous years and using those previous player salaries as a baseline. 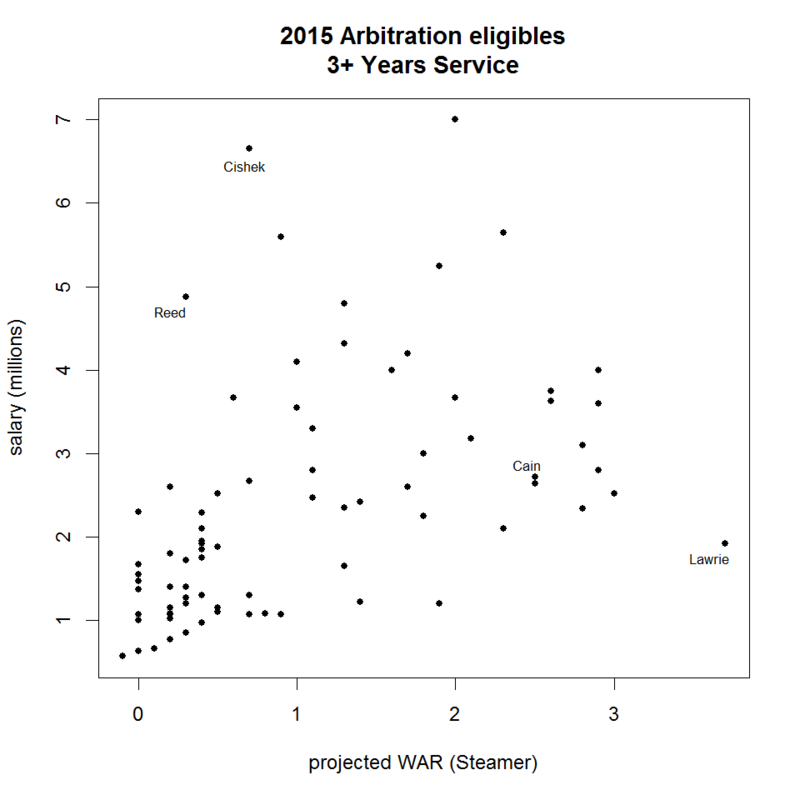 While arbitrators factor in some inflation to their valuations, the reliance on comparisons to salaries from past years makes it difficult for arbitration salaries to keep up with MLB’s constantly rising revenues and free agent salaries, especially when there is a large influx of money, such as with recent TV deals or the rapid growth of MLBAM. This is exacerbated by the fact that arbitrators generally give the most weight in these comparisons to player contracts from the same service class as the player being considered, and that the Collective Bargaining Agreement explicitly directs arbitration panels to focus on players from no more than one service class above the player in consideration. This means that, save for exceptional cases, free agent contracts are generally used only as a comparison for players in their final year of arbitration, and even then they get less weight than other arbitration contracts. If baseball has an influx of revenue, that will immediately impact the free agent market, but that impact will take time to trickle down to arbitration cases. We can see the effect this has had on arbitration salaries over the years. Last year, David Price earned $19.75 million in his final year of arbitration. While that sounds like a lot, and is in fact an arbitration record, it is way less than free agents of his stature earn. The same offseason, Max Scherzer signed for $30 million a year over seven years. A year earlier, Clayton Kershaw had signed an extension worth nearly $31 million a year over seven years. Price himself signed for seven-years/$217 million this offseason. Compare that to Jack McDowell, who in 1994 received $5.3 million in his final year of arbitration. That placed McDowell among the highest paid pitchers in the game. Roger Clemens, for example, was in the third year of a four-year, $21.5 million deal (with an option for a fifth season at an additional $4M), and David Cone was in the middle of a three-year, $1 million deal. McDowell signed the following year as a free agent for $5.4 million, and then again the next offseason for two years/$10 million. Clearly, the standards have changed as MLB revenues and free agent salaries have continued to escalate, and arbitration salaries have failed to keep up. The lagging annual salaries don’t tell the whole story either, because teams are now willing to give out longer-term contracts to elite players than they were in the past. Those three- and four-year deals guys like Clemens and Cone were signing in the early ’90s have evolved into six- and seven-year deals for today’s top pitchers. This is important because a seven-year deal is worth significantly more than a four-year deal at the same annual salary. If teams were simply paying higher salaries, that would eventually work its way into the salaries used for comparisons in arbitration hearings, but increasing the number of years instead of the salary doesn’t have the same effect. And while long-term free agent contracts are part of this effect, the increased prevalence of long-term extensions for arbitration and pre-arbitration players is an even bigger factor. Someone like Mike Trout, for example, could very well shatter every arbitration record, in the meantime raising the baseline for every future arbitration-eligible player in the process. However, by trading the risk of going year-to-year for the security of a long-term extension, he is accepting lower annual salaries than he could have gotten in arbitration, assuming he stays healthy and productive. This is a good trade-off for Trout, but it also lowers the salaries that other players get compared to. It’s now fairly uncommon for an elite player to make it all the way through his arbitration years without a multi-year extension, which in turn holds down the salaries that players can use as comparables in arbitration. The empirical data bear this out. In the 2007 Hardball Times Annual, Dave Studeman found that arbitration-eligible players were paid roughly half of what they would be expected to earn as free agents. TangoTiger expanded Studeman’s finding into the 40/60/80 rule: Players with three-plus years of service make roughly 40 percent of their market value, those with four-plus years make 60 percent, and those in their final year of arbitration make 80 percent. This was already a big drop from the early 1990s, when players in their final year of arbitration could earn close to their market value. Recent research has found that these shares have continued to slip, and now fall closer to 25/40/55-60 than 40/60/80 (which matches roughly with the figures I get using the data from the above graphs). The reason I brought up the Elias rankings earlier wasn’t so much to point out how they were broken, but rather how they were fixed. The point of the rankings was to identify the most highly valued free agents to determine which free agent signings would be taxed. When the rankings failed to reflect players’ actual market values, rather than update the formula, MLB turned to a more efficient solution that relies on the market itself to determine value. The point of the qualifying offer is that any free agent valued above a certain amount (currently $15.8 million) is subject to the draft pick compensation tax if he signs with another team. To determine which players are valued that highly, MLB simply sees which players get offered a one-year, $15.8 million contract (i.e. a qualifying offer) by their former team. It’s a simple and elegant solution. Not only does this eliminate any inefficiency in the formula predicting market values and keep up with evolving player evaluation techniques, it also ensures that the model keeps up with changes in market values as MLB revenues change. In other words, it gives us an ideal framework to address the major problems with arbitration salaries. The qualifying offer itself won’t work as a replacement for salary arbitration because of its binary nature: It is not able to determine a player’s precise market value, only whether it is above or below a certain threshold. To assign a specific salary, as arbitration does, you need to involve more teams in the bidding process. Players who would currently be eligible for arbitration who are without a contract for the following season instead become restricted free agents. They are free to negotiate a one-year contract with any team, and the player’s current team has the right to retain the player by matching any offer. In order to match an offer to a restricted free agent, the current team must pay a prescribed fraction of the rival team’s offer, with the fractional amount determined by the player’s service time. For example, say you want to emulate the 40/60/80 structure. To retain a player in his first year of restricted free agency, a team would have to match only 40 percent of the rival offer. And then of course 60 percent for players in their second year, and 80 percent for the third. Let’s go back to Lorenzo Cain as an example. Cain is now in his second year of arbitration, so if teams value Cain at something like $20 million for one year on the open market, it would cost Kansas City $12 million to keep him. Simple enough, right? But let’s say a team like Cleveland, which expects to compete with Kansas City for a division title, decides to offer Cain $25 million. The Indians understand that Kansas City would be foolish to let Cain go at below market value, so by offering Cain more than he’s worth, they can push the price KC would have to pay up to $15 million. Kansas City could decline and stick Cleveland with a $5 million negative surplus on the deal, but the Royals would have to give up $5M surplus value themselves, so they wouldn’t really gaining anything even relative to just Cleveland. If a team declines to match an offer to a restricted free agent, the player receives the same contract he/she would have gotten had his/her old team matched, with the remainder paid to the original team for the transaction. In the Cain example, that means if Kansas City declines to match the $25 million offer, Cain still gets a $15 million contract, and Cleveland pays KC the remaining $10M surplus value. Now, it won’t make sense for the Indians to offer Cain any more than they think he is actually worth, because all they would accomplish by overbidding is increasing Kansas City’s surplus value: Instead of paying $12 million for a player worth $20 million (good for $8 million surplus), they could just take $10 million. This sounds like it might encourage teams to sell off their arbitration-eligible players to collect on the surplus value, but it really just preserves the current market incentives. Teams can, and sometimes do, trade arbitration-eligible or pre-arb players to cash in on their surplus value under the current system. This just makes it more explicit how value is being transferred because the return is in cash rather than player assets. The current team must offer restricted free agents at minimum their previous year’s salary, even if that is more than the prescribed fraction of the rival offer, or else the player becomes an unrestricted free agent. This set of rules creates a system that preserves most of the critical elements of the current arbitration system, but reflects market value and adjusts to changes in the game’s economic climate much more efficiently. We can take this one step further and eliminate the arbitrary cut-off points used in the current system. 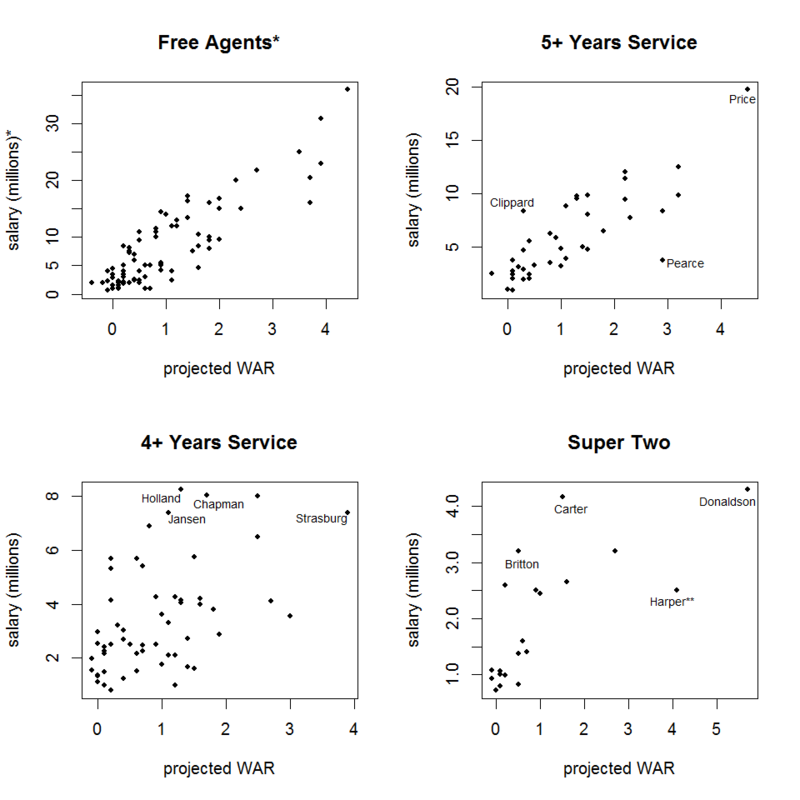 Currently, players not yet eligible for free agency are divided into five classes based on service time: pre-arb, Super Two, three-plus, four-plus and five-plus years of service. Which group a player falls in can have a significant effect on his salary, especially at the cut-off between the pre-arb and Super Two groups. This stratification makes it possible for arbitration panels to classify players and identify appropriate comparables, but it also means, for example, that there can be zero difference between having 2.000 and 2.130 years of service (service time is expressed with the number of years before the decimal and the number of days after, with 172 days constituting one full year of service), but a massive difference between 2.130 and 2.131 years of service if that happens to be the cut-off for Super Two classification. Likewise, a player who falls one day short of free agency is treated the same as if he had exactly five years of service. Prospects who are presumptive starters out of spring training are kept in the minors for the first couple weeks of the season to prevent them from reaching a full year of service (and thus delaying the time it takes to reach 6.000 by another year). An example of this would be Kris Bryant last season. Prospects who are major-league ready are kept in the minors for an extra couple of months to prevent them from reaching Super Two status. An example of this would be Stephen Strasburg being kept down until June in 2010. A player with 3.000 years of service will be paid 40 percent the value over the league minimum of an accepted offer from a rival club. Each day of additional service above or below 3.000 years will raise or lower this fraction by 1/172 * 20%, or 1/860. Players with less than 1.000 year of service may be paid the league minimum. You could adjust these figures to get different values, but this version is set up so players start earning raises after 1.000 year. They would earn 20 percent of their market value at 2.000 years, 40 percent at 3.000, 60 percent at 4.000, 80 percent at 5.000, and 100 percent at 6.000. Under this model, holding down a prospect an extra week or two can still gain a team an extra year of control over a player, but it won’t actually save the team much money since it will have to pay nearly the player’s full market value for that extra year. The arbitration process is intended to mimic the market value of players, but it falls short in several ways. Precedents based on outdated player evaluation methods mean that arbitration values can vary significantly from market values. The comparables-based system that relies heavily on past salaries has difficulty adjusting to economic changes, as well as adjusting for multi-year contracts and extensions to arrive at an equivalent valuation for a one-year contract. The system has proven unable to keep up with rising revenues and market values, and the amount arbitration-eligible players receive relative to comparable free agents has been decreasing over the past couple decades. An open-market system based on the restricted free agent model used in other sports addresses these issues, and can be modified to fit the peculiarities of MLB’s arbitration system if so desired. This might seem like a radical change to bring to a system so entrenched in the game, but MLB has used a similar open-market solution to address the problem with free agent compensation in the past. Besides, I don’t think there are too many in the game who would miss arbitration hearings much anyway. At the very least, Jeff Mathis won’t. Innovative, logical, fair, and clearly described. Couldn’t imagine a better article on the subject. Too bad it doesn’t have a chance of being accepted by anybody in baseball. Maybe I missed it, but how would this handle what could be a massive difference between single year (read: low risk) salaries and your typical multi-year FA contract? My mind boggles at the salary offers an arbitration-eligible Bryce Harper might command if teams knew they were only getting him for a single year and didn’t have to bake in long term injury risk or decline. You could very easily get a salary spike, where a certain class of RFAs earns (or at least costs) far more annually than they would ever get as ordinary FAs. Yeah, that could complicate things further, although unless a player is expected to improve substantially the next year– otherwise the exclusive negotiating window and the mandated non-paycut rules woiuld basically nullify the issue of overpaying the single year market value of a guy. I think. Anyhow, the system still holds I think if you mandate that restricted free agents that change teams are full free agents after that one year. Why doesn’t your logic apply to every year? Do you guys still need writers? I hate to post this in the comment section, but I haven’t been able to find the email of people, so this is the only way I could ask. If you could email me the info, that would be greatly appreciated! Also, feel free to delete this comment if necessary. Thanks! The problem I have with this is that you are not adequately rewarding teams for drafting/development by allowing other teams to bid for the player. Also, just paying the difference in surplus to the original team doesn’t stop big market teams from exploiting lower market teams. The same way it doesn’t stop them blowing bust the international bonus pools. This is a bizarro internet article trying to ‘fix the problem’ of how much male professional baseball players make relative to each other. Yes, the players do get more in free agency. Jeez. While this is a nice proposal in theory, it wouldn’t work in practice in a sport without a salary cap like baseball. The rich teams like the Yankees and Dodgers wouldn’t mind paying well above market value if it meant they could steal away the best young players from the smaller market teams. Heck, they sometimes already do that with normal free agents, and those guys are much more likely to be past their prime in the later years of their new contracts.